Commonwealth Games gold medallist, Anton Cooper has reclaimed New Zealand Mountain Bike Championship honours after winning the Elite Men’s XC race in Rotorua today. In a repeat of the Glasgow Commonwealth Games, Cooper held off fellow New Zealand representative Sam Gaze. After both riders cleared out from the field early and headed into the last lap of the race side-by-side, Gaze made a mistake with his front wheel getting wedged in a tree. This provided Cooper the opportunity to seize control and go on to win by 1 minute 10 seconds. “I really wanted to get the jersey again,” said an elated Anton Cooper. “I love wearing it overseas so I decided to focus on it (the elite race) a bit more, and it paid off. “I just wanted to go out and hit most of the climbs hard. I did that but hit a flat spot mid-race and felt a bit sick. The result was a reversal of last year’s race where Gaze triumphed in a sprint finish over Cooper. Local rider, Dirk Peters rounded out the podium, finishing a further 2 minutes behind Gaze. 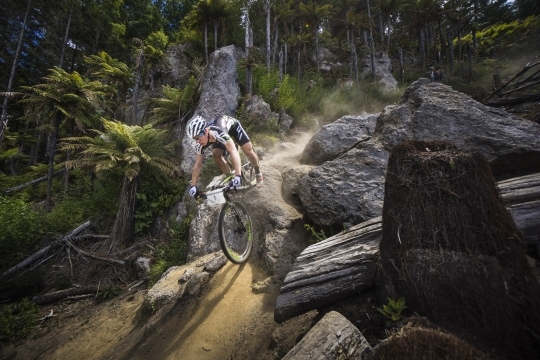 PHOTO CAPTION: Anton Cooper on his way to the national cross country mountain bike title.